While researching a little about the brain here, I found that in respects to alcohol, drinking a large amount will cause an interference within the brain. What happens is alcohol will block the receptors within the brain; more specifically the individuals hippocampus. The hippocampus is most closely associated with long term memory. When the receptors are blocked, additional receptors are stimulated which overall causes the interference of the reaction between these specific neurons. Overall, this disruption deters the ‘long term potentiation’. This is what is used to form memories and activate learning. Something I found interesting here, was that the term ‘brown out’, is also a valid term. My friends have used the term brown out in past time and I always somewhat mock them because the idea sounds somewhat ridiculous as if there is a colored scale for how incoherent you were the night before. Basically, what I found is there is two types of blackouts. En bloc blackouts are the real deal blackouts. These are the times where you are completely unable to retain memory at this point even if it might seem as though you are completely functioning and able to carry a normal conversation. In a test of time, this type of blackout keeps your recalling ability to about two minutes prior, anything beyond that is lost. The fragmentary blackouts are where the person is able to recall certain events from the night but not all. If their memory is promoted by another person they might begin to recall some information, this would be classified as a “brown out” in lack of a better word. Now in respects to the long term effects, I found here long term effects do exist. Repeated blackouts can cause issues such as permanent memory damage, impaired brain development and slow learning, acting out in a way that creates issues within behavior, and more significantly brain damage. Now after reading all of this, it seems to suggest that repeated blackouts when drinking hint to risk of alcoholism. Bottom line, I do think my hypothesis is correct but I think It comes into play within more severe cases. I don’t think the occasional blackout is great for you, but I don’t think it will have any severe effect based on these findings. These drastic effects come to light if an individual suffers from alcoholism. This entry was posted in Uncategorized on November 29, 2016 by Olivia Anne Browne. Very relevant post especially for us in a college town where some try to drink as much as they can in a short amount of time. I knew it was not healthy to drink until you black out but I didn’t know it could damage your brain. I usually dont drink much but I have been around people that were able to have full conversations later to not remember a thing about it the next day. I had also never heard anyone refer to a brown out before, but have had people remember parts of a conversation weeks later after I referred to the topic we had discussed. Its very interesting that a few words can bring back a memory that you didn’t even know you had. I know someone who is prescribed xanex for anxiety and his first time drinking after getting the prescription he blacked out while barely drinking. I wonder if the xanex and a small amount of alcohol are affecting the brain in the same way as binge drinking. Interesting post, it definitely drew a lot of attention. You can see that this is something that is a popular subject among college students, parties are rampant and drinks are very assessable and free. We all have that one friend who drinks too much and at the end of the night is either incoherent or doing something that could end in a variety of bad ways. Is this because he or she wants to be the one with the craziest story to tell the next morning or because “hey it’s free”. 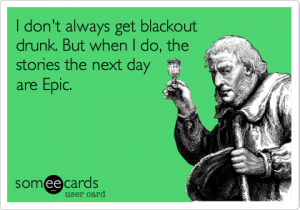 Blackouts are something of a concern at universities today and you can see the awareness that is being spread throughout schools by having student’s complete alcohol surveys before classes start. There are a lot of factors that go into blacking out such as; height, weight, the amount you drink, and how your body reacts to the substances. Your BAC is not something that anyone keeps track of while their out drinking but it does have a lot to do with the stage at when you blackout. I do agree with the fact that over time after numerous blackouts you brain along with other internal organs will begin to become damaged. I think to further the research on your hypothesis, I would conduct a study with 2 randomized groups. One group would black out for consecutive nights while the other group would stay sober. This would have to be followed up by a physical exam later in the subjects lives to see if their is any long term effects. The only problem is that this might be unethical unless you had volunteers to blackout. However, when running an experiment with volunteers you run the risk of volunteer bias which we learned about earlier this year. Really interesting post! This is something that is completely relevant and something everyone needs to become more aware of. We all know that drinking too heavily can cause health issues but I doubt people really know to what extent. I never considered that there was medically different types of blacking out. I will really take this post into consideration throughout the next couple of years. I’ve always known blacking out was bad for your health but I never knew exactly why until now. This was very interesting so I went ahead and did a little more research. The National Institute on Alcohol Abuse and Alcoholism had some eye opening things to say. I had no idea that Alcohol could lead to a change in physical appearance and even the development of new brain cells… sadly not the kind that make you smarter. Thank you for sharing. If you would like to see where I found this information, click the link below. This was a very interesting post about something everyone in the class can relate to in one way or another whether as the victim of becoming blacked out or being in the presence of someone who is blacked out. And one thing I learned from reading this is that Brown out is a valid term rather than a concept on my personal favorite episode of It’s Always Sunny in Philadelphia. But to further test your hypothesis and the others that are out there I believe an experiment needs to be conducted. As a previous replier mentioned I believe that number of drinks and type of drinks taken such as beer, vodka, tequila(always a bad idea), or my personal favorite whiskey. Although it may be facing some ethical problems doing this study and forcing people to drink I think some compensation can lure people into doing the experiment. I also believe that to find exact,reliable data, a screening of the experimental groups must be done before the experiment is conducted, so the people in the study can be as comparable and generalizable as possible. In addition to the memory portions of the participants being studied, medical data about the brain can also be studied. I find it super interesting that the body is able to continue functioning and give off the outward appearance that you are fine. I know there are times where I descried to friends exactly how they acted the night before and they don’t remember it, which is odd because at the time there didn’t seem to be anything majorly different about them. And I’m sure that there are long term health detractors from this, as there are from harming your body in any other way. Reading this article against drinking to the point of blackout (http://www.addictionpro.com/article/take-blackouts-seriously) helped me get a perspective from an anti-drinking PoV, but I think that their reasoning against it is sort of wonky because they say that you completely lose a sense of who you are which I don’t think is true. This blog sparked an occasion that I had at one particular time when asked about drinking at a doctors office. They always ask in physicals if you drink, and if so how many drinks a week. When the Doctor came in the room I asked about the drinking, I didn’t see any harm in it and who hadn’t had one to many before and what was the harm. My doctor went on to tell me that blacking out is a form of amnesia, and it could case serious issue long term down the road. Every since then, I always keep my drinking in check with what I think I can handle. This was a very interesting read. I wonder if they study was controlled and accounted for other variables? Some people have an higher tolerance than other also, I wonder if that was accounted for?! Here is some info on where I found out more about blacking out and amnesia! I found this article super interesting to read. I have always wondered what actually happens when someone blacks out and how it happens. It is good to know that it is a result of receptors being blocked. I think it would have been interesting if in your blog you went into detail about how different alcoholic drinks can effect this, for example wine, vodka, beer, etc. It would have also been really beneficial to have a study that showed numbers and the results of blacking out. For example studying a group of subjects and each of their responses and receptors after taking each shot. By the fourth shot, how would their brain be responding, etc.